Israel has announced it will investigate the shooting of a British peace campaigner in the Gaza Strip. 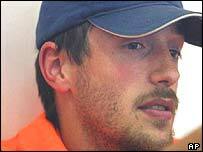 Tom Hurndall was hit in April while trying to protect women and children, according to his campaign group, the International Solidarity Movement (ISM). The 22-year-old, who had lived in Manchester, had been working with the group in the town of Rafah when he was shot. He is now in a deep coma in intensive care at the Royal Hospital for Neurodisability in Putney, south-west London, after suffering severe brain damage from which he is not expected to recover. As a result, medical specialists, after talking to Mr Hurndall's family, have begun the process of applying to the High Court for the discontinuation of his treatment. On Sunday, the Israeli Judge Advocate General agreed to conduct a military police investigation into the shooting. The judge added that that the evidence provided by Mr Hurndall's parents "was taken seriously and played a crucial part in securing the investigation". Anthony and Jocelyn Hurndall from Tufnell Park, north London, have been campaigning for an inquiry and met Foreign Secretary Jack Straw in June to call for the soldier who shot him to be prosecuted. The parents claim a report from the Israeli Defence Force is inaccurate and a "rudimentary cover-up". They have produced their own report which they say takes into account eyewitness statements, expert opinion, photographic and video evidence and interviews with Israeli Defence Force personnel. They say the only thing the two accounts agree on is that Tom was shot at a checkpoint. The British Foreign & Commonwealth Office has said no timetable has been set for how long the investigation will take, but said other military police investigations have lasted about three months.